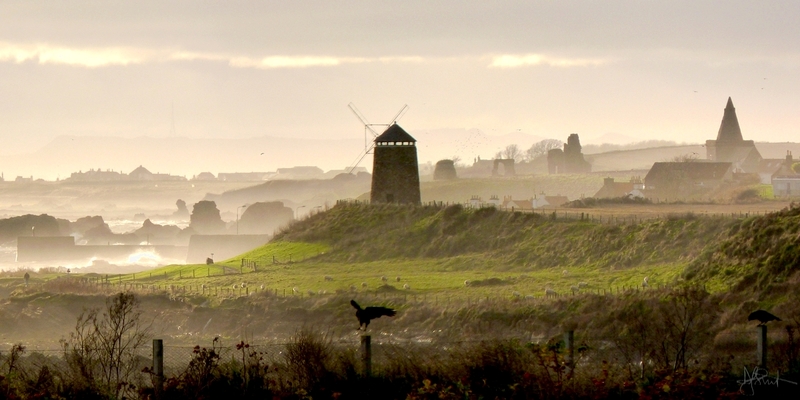 Over the years, I’ve taken a lot of photographs of St Monans’ landmarks, individually and collectively. From a few places, they are all visible and almost aligned. By carefully picking your viewpoint – a few yards can make a big difference – they can appear side by side. Move far enough away, use a telephoto lens, and the compression effect can make them look much closer together than the mile or so that lies between the castle and the windmill. I have exhibited some of these images at the Arts Festival, and used them on the village website and facebook page since setting those up nearly ten years ago. Now I am making them available to order in a range of sizes and formats. The first image can be supplied as a 90cm by 30cm photocanvas for £80 (other sizes, mount and framing options on request). The image above is a low resolution version of the print. The image below gives a closer view when you click on it (it will open up as a separate tab or page). A second image from the same series of photographs is available with a 2:1 aspect ratio – I can supply it as a 80cm by 40cm photo on canvas for £80; or 100cm by 50cm canvas for £100. Other sizes and formats on request.